Following on from our recent article comparing these two strategies (Inbound v Outbound Which Really Works? ), I wanted to dedicate an article to how Outbound strategies and channels can support Inbound tactics and make your efforts more effective. INbound is where, by producing informative and engaging content, prospects come IN to your site or mailing list of their own volition. This could be through your blog, to download an ebook, signing up for a newsletter or webinar etc. Something key I want to highlight is the decision does not have to be either/or in these cases — Inbound and Outbound need each other to produce results. Inbound marketing is fantastic for building a brand presence and awareness amongst your audience, an audience that will be more likely to respect your authority in an area than they would reading your ‘groundbreaking’ ‘disruptive’ ‘best in the business’ cold email offering. However, there are drawbacks with Inbound. Just because you have brought an audience to your site and got them engaging with your content, does not mean that they are going to convert any time soon (or ever). Brand awareness and building a presence online takes time — and without those immediate conversions and results, smaller companies and startups may struggle to keep investing in Inbound strategies. Inbound is great for the long haul, but client acquisition (especially acquiring the RIGHT kind of client) takes time. Outbound in the earlier stages can help fund your inbound investment and help you through the less financially stable stages of a startup. Or indeed, if you are more established, outbound helps you leverage sales from Inbound leads or Inbound audiences. What Outbound can do is work to leverage your Inbound efforts to actually make a sale. I am going to run through four key areas that Outbound can support your Inbound strategies. 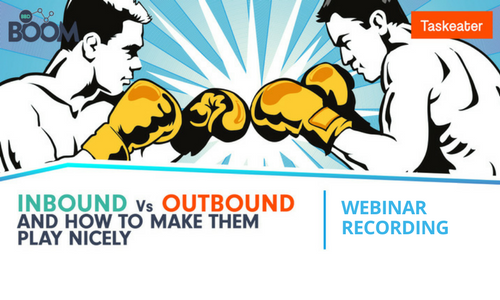 For a more comprehensive view of the similarities, differences and possible strategies you could leverage for your business, listen to a recording of our webinar with Inbound experts BBD Boom. Register and receive a full recording of the webinar, complete with presentation slides. Prospect profiling is key for both Inbound and Outbound strategies — to make a sale you need to have an understanding of who you are selling to. While Inbound can generate content to attract certain groups of people interested in specific areas to your site, Outbound allows you to reach out directly to those people with a message tailored to them. With advancements in email automation and personalisation, as well as the simple fact that people spend a great deal of time in their inbox, research shows that email is the top lead- and revenue-producing vehicle for B2B marketers. Because you can see how prospects engage with your offering first hand when you are fielding responses from an Outbound campaign, these strategies also enable you to paint a clearer picture of your target persona, which in turn allows you to create more specific and tailored content to draw the RIGHT kind of people onto your site. One of the most fundamental reasons for Inbound not working is the fact that marketers and copywriters forget what the end goal is — making sales. There are 4 key aims of content production — illustrated by CSDM in the content matrix illustration provided. While educational and inspirational content might draw people to your site, persuading and convincing your audience are the keys to seeing any ROI. You need to ensure you are generating BoFu (bottom of the funnel) content to convince and convert your customers, articles that focus on your service and product, not just drawing them in with your titillating ToFu (top of the funnel) articles about areas of interest (as opposed to services). 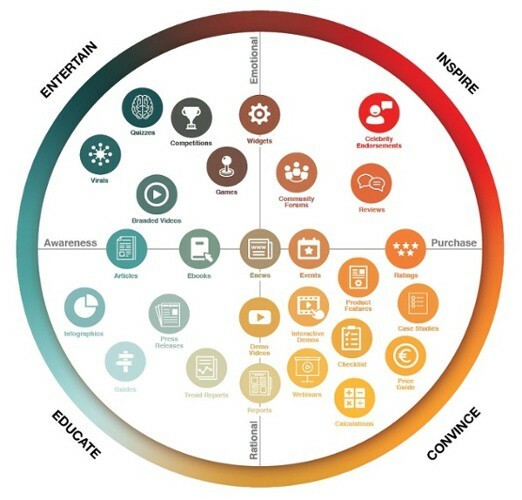 The promise of cost-effective content-based marketing is being challenged for Hubspot and those that buy into the Hubspot methodology by the sheer amount of companies buying into the methodology. The internet is saturated with content — a phenomenon marketing strategist and author Mark Schaefer calls content shock. Every brand and its competitors are generating content aiming to draw people onto their sites and build the ever sought after ‘thought leadership’, but with so many voices it is getting harder and harder to cut through the noise. What is more, the means of distributing content in the Inbound way, principally through social media networks, has also fundamentally changed. Platforms like LinkedIn and Facebook have changed their algorithms and are no longer as accommodating to links as they once were. In order to be profitable, the means by which we think about content distribution has to change. As Louis Gudema explores, even Hubspot has quietly started to add traditional “push” advertising and digital ads to its marketing mix. Using outbound email campaigns to circulate content, or indeed display retargeting on particularly product based content, can help not only circulate content in a greatly saturated marketplace, but also see conversions from your content. Display advertising, a digital outbound technique, has a notoriously low ROI. The average clickthrough rate of display ads across all formats and placements is just 0.06%. What is worse, there are now 198 million active ad block users around the world. Display advertising and retargeting can also be frustrating — with 33% of internet users find display ads completely intolerable. By having retargeting on BOFU content, or by identifying content and landing pages which indicate a greater degree of interest in your service, you can ensure your banner ads are being served to visitors who have signalled intent. What that means is you are not wasting budget on people who just fall under your demographic industry and geographic criteria — the people who will be frustrated by your ads because they aren’t relevant — but instead will focus instead on people who already have an interest in solving a particular problem. Retargeting more generally should still be a technique you use even running the risk that you won’t have many conversions, because the one thing Inbound really can’t do is get your solution in front of someone who doesn’t know they have a problem. Another way around content saturation and the competition on social media is to leverage other people’s reach to increase your own. Influencer marketing is a way of cutting through the competition. Referrals speak louder than any paid campaign, with 70% of millennial consumers are influenced by the recommendations of their peers in buying decisions and 30% of consumers are more likely to buy a product that has been recommended by a celebrity blogger. Sourcing influencers is where Outbound methodology comes in — reaching out via email and social messaging and communicating your offering will grow your network and provide a potential channel for content distribution. Influencers can also provide guest writing posts and quotes for your articles — which increases your reach when they share on their networks, and means a higher number of visitors on your site. Writing guest posts yourself for other publishers or company websites is another way of increasing your brand awareness and reach. While effectively an Inbound strategy as it is content-based, getting featured on a website involves reaching out to publishers and partner companies and building a relationship. Again, email is an invaluable tool here and creates possibilities where other channels can’t. Use your outbound campaigns to build a clear picture of your perfect prospect and learn about what they engage with from your offering. 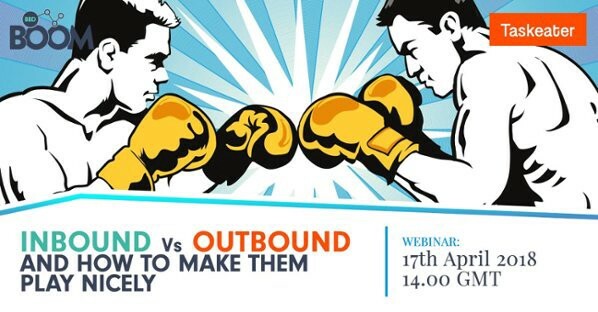 For a more comprehensive view of the similarities, differences and possible strategies you could leverage for your business, listen to our webinar recording with Inbound experts BBD Boom. Managing Director of Taskeater and one of Taskeater’s former clients. He has 16 years of sales experience, two boys and loves rugby. Connect with Dan. This story is published in The Startup, Medium’s largest entrepreneurship publication followed by 316,028+ people. Providing specialist offshore teams and lead generation, keep up with our insights here. Expert in efficient business processes and growing startups and SMEs.